When we get curious in our relationships we create a space where we can better understand each other. How many times has someone said something you took differently then they meant it. It happens all too often. Our words and actions can be interpreted differently by anyone even those closest to us. So when we let go of our fear and we question what it meant by the words or actions we begin to grow our relationship. We become eager to understand each other and connect deeper. Next time you hear words that hurt you, ask a question. Get curious about what the words actually mean to that person and begin to learn and grow. We all come from different walks of life what something means to you may be completely different to someone else. Ask, don’t assume you know even in those relationships that have been growing for several years. When we get curious about what something means, we take away the negativity that can swirl throughout our minds when we are uncertain. Instead of keeping the questions in your mind swirling and swirling into a darker hole, just ask them! By getting curios we can bring so much positivity back into our life. We can do that because we begin understand. We can do that because we stop assuming we know all and we open up to learning and exploring. Have you ever found yourself wondering why something didn’t work out like let’s say you interviewed for your dream job and it didn’t work out. Then you jump into your mind with all kinds of negativity and the swirls begin. The only way to fix that is to find out why it didn’t work out. Is there anything wrong with call the job place and asking why did this not work out? I want to improve myself for the next opportunity. Bam negativity switched to positivity because now you have created a learning experience and maybe even opened up some doors by showing you’re interested. Negativity can be a huge weight on our shoulders and to really let it go we must become curios. We must find the answers for ourselves so we can let the negativity go and move into positivity. When we explore, when we learn, when we allow ourselves to be curious we open up so many doors. Opening up that curiosity allows you to ask questions to research to find answer you otherwise may never have known. When we learn we grow. When we explore we grow. Life is a journey and in every moment we have the opportunity to grow. Ask those questions. Be Playful! Grow, Grow, Grow. The world we live in is based so much in opinion. Most of what we read and hear is opinion. So let’s remember that. There is a huge difference between a fact and an opinion. So when it comes to making choices we want to make them based on what is best for ourselves not everyone else. By all means read and explore the opinions and writings of others. This is how we learn and grow. Just remember to be curious. Ask questions and do your own research. And when we explore the opinions, writings, experiences of others and then question, research and do it for ourselves we are making our own choices. The curiosity really allows to connect within and figure out what we need. Last but certainly not least curiosity lets us experience life on our own terms. When you stand up and get curious you begin to express how you feel because you started the conversation. You get to explore new things in life as you want to. I’ll explain. If you are going about life miserable because you feel your significant other isn’t helping with household chores lately and just seems depressed. Be curious and ask hey what’s going on? Have a conversation so you can understand. And express your own feelings. We don’t have to life in someone else’s misery. When we get up a ask questions and explore we learn how to experience life in a way we want to, a way we can enjoy. Curiosity helps us to feel free and stay free by explore when the time comes. It allows us to grow with nothing hold us back. Curiosity opens us up. 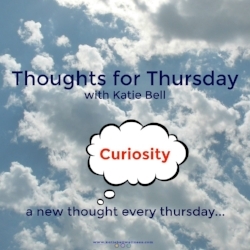 Curiosity lets you think, explore, and experience life on your terms and in your time! Curiosity can be scary, you are powerful though! Get out there and get curiosity. Ask, Explore, Grow! You’ve got this!